Listen to "It All Adds Up: The Story of People and Mathematics" on your iOS and Android device. From Aristotle to Ada Lovelace: a brief history of the mathematical ideas that have forever changed the world and the everyday people and pioneers behind them. The story of our best invention yet. From our ability to calculate the passing of time to the algorithms that control computers and much else in our lives, numbers are everywhere. They are so indispensable that we forget how fundamental they are to our way of life. 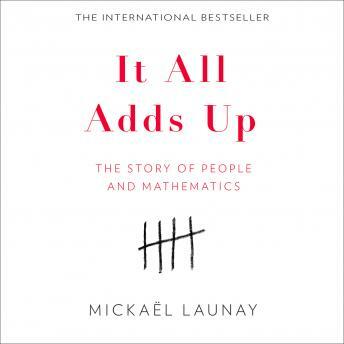 In this international bestseller, Mickaël Launay mixes history and anecdotes from around the world to reveal how mathematics became pivotal to the story of humankind. It is a journey into numbers with Launay as a guide. In museums, monuments or train stations, he uses the objects around us to explain what art can reveal about geometry, how Babylonian scholars developed one of the first complex written languages, and how 'Arabic' numbers were adopted from India. It All Adds Up also tells the story of how mapping the trajectory of an eclipse has helped to trace the precise day of one of the oldest battles in history, how the course of the modern-day Greenwich Meridian was established, and why negative numbers were accepted just last century. This book is a vital compendium of the great men and women of mathematics from Aristotle to Ada Lovelace, which demonstrates how mathematics shaped the written word and the world. With clarity, passion and wisdom, the author unveils the unexpected and at times serendipitous ways in which big mathematical ideas were created. Supporting the belief that - just like music or literature - maths should be accessible to everyone, Launay will inspire a new fondness for the numbers that surround us and the rich stories they contain.